Derofe Fine Writing Instruments have been delivering the best in pens since 1947, and the Banker Rollerball Pen continues the tradition in fine style. With super smooth rollerball and black ink, this precision pen is immaculately presented in an elegant black giftbox. Spare quality German Schmidt ceramic roller refill included with 0.07mm nib and 500m capacity. 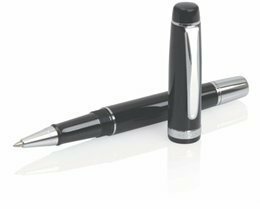 This black, quality pen has chrome trim and comes laser engraved with your client's logo on the upper barrel and will satisfy those with a passion for writing.